Learning Mastery scores are used by your instructor to measure performance based on classroom learning standards, or outcomes. 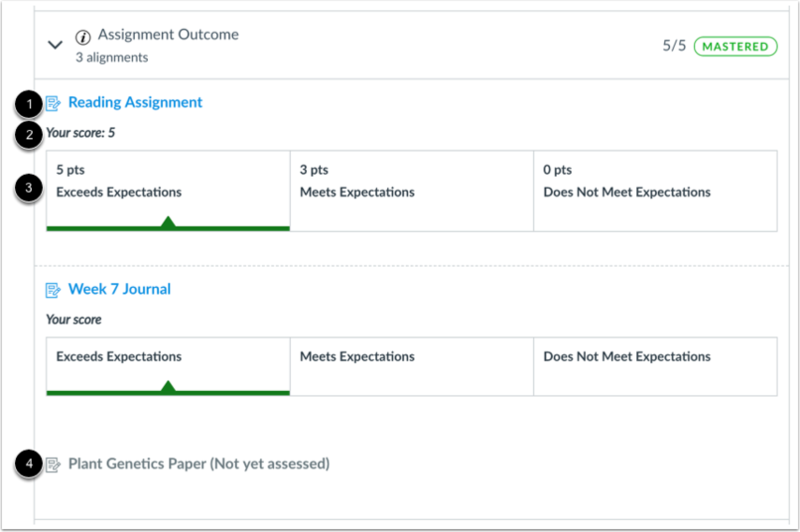 Outcome scores may be tied to assignments and other items throughout Canvas. 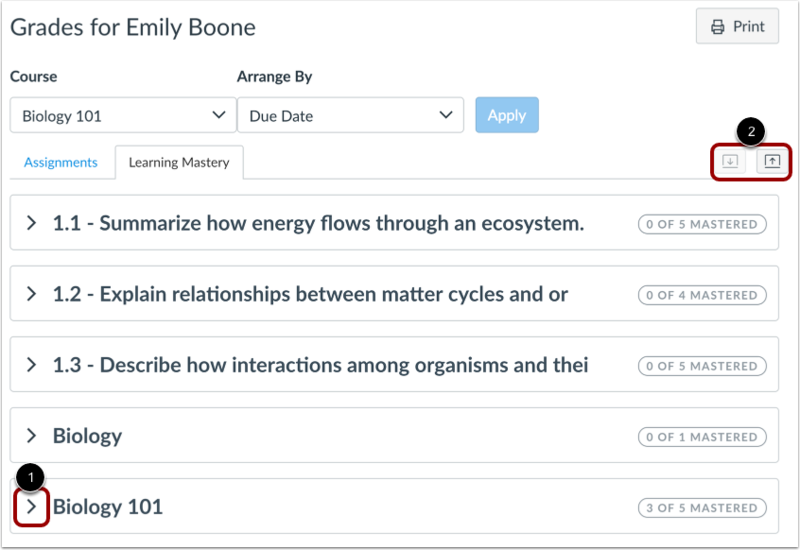 If your Grades page shows Assignments and Learning Mastery tabs on the Grades page, you can view standards-based scores in the Learning Mastery tab. On the Grades page, click the Learning Mastery link. 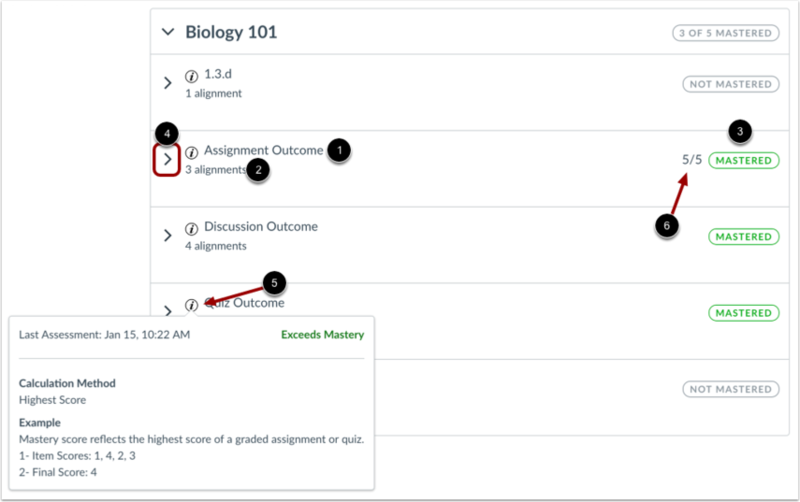 In the Learning Mastery tab, you can view overall details about the outcomes available in your course, including the name of each outcome group  and the outcome summary. The outcome summary displays the number of outcomes you have mastered and the total number of outcomes in an outcome group . Click the Print Grades button  to print your outcomes results. To view individual outcomes, expand the outcome group by clicking the expand icon . You can also expand or collapse all outcome groups at once by clicking the expand and collapse buttons . Each outcome displays the outcome name , the number of alignments , and whether the outcome has been mastered . To view the course items aligned with an outcome, click the Expand icon next to an outcome name . To view outcome details, such as the date and time of the last assessment and outcome score calculation method, hover over the Details icon . The total outcome score is visible if at least one alignment displays the point value . Your instructor may choose to hide the total score for an outcome. All course items aligned to a specific outcome display in the aligned item details. Each aligned item displays the item name . Assessed items display your score  and outcome details . Items that have not yet been assessed display below assessed items and indicate that they are not yet assessed . If your instructor has removed points from outcomes, you can still view the rubric results for your assignment. If your instructor has muted an assignment, you will not be able to view the rubric results until your instructor unmutes the assignment. Click the aligned item name link to view details for the aligned assignment, quiz, or discussion. To view the standard Assignments grades page for your course, click the Assignments link . 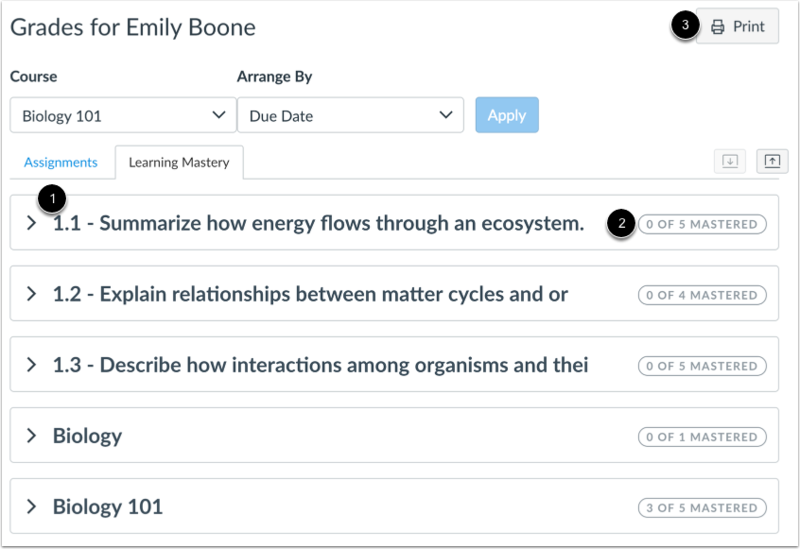 You can toggle between assignments and Learning Mastery at any time. If you have more than one course, you can view grades by selecting another course name in the grades course drop-down menu . Previous Topic:How do I view my grades in a current course? 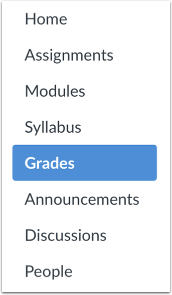 Next Topic:How do I use the icons and colors in the Grades page? Table of Contents > Grades > How do I view my Learning Mastery scores in the Grades page?